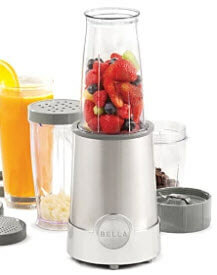 All your blending & grinding needs will be taken care of with this compact and sturdy BELLA Rocket Blender. With one easy twist it can it all. The blending blade will create nutritious smoothies, creamy sauces and spicy salsas, while the grinding blade will swirl away homemade nut spreads, grind coffee beans, spices and seeds for savory seasonings.